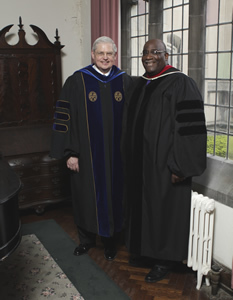 EVANSTON – Bishop Gregory V. Palmer delivered the address at Garrett-Evangelical Theological Seminary’s 154th commencement, where he was also awarded an honorary Doctor of Divinity Degree. The service was held at First United Methodist Church in Evanston May 13. Bishop Palmer suggested that the graduates, and indeed all of us, have three crowns to aspire to wear: a crown to continue in robust theological engagement; a crown to live more meaningfully and faithfully in the global village in which we find ourselves; and a crown of character and righteousness. To hear Bishop Palmer’s entire address, visit www.garrett.edu/videos. Garrett-Evangelical, founded in 1853, is a graduate school of theology related to The United Methodist Church. Located on the campus of Northwestern University, the seminary serves more than 400 students from many denominations and cultural backgrounds, fostering an atmosphere of ecumenical interaction. Garrett-Evangelical creates bold leaders through master of divinity, master of arts, master of theological studies, doctor of philosophy and doctor of ministry degrees. Its 4,500 living alumni serve church and society around the world.